Bull riding and barrel racing by the Buckin B Cattle Company was held in the Grand Stand Arena Monday evening at the SciotoCountyFair. Pictured is a cowboy trying to qualify for his ride. 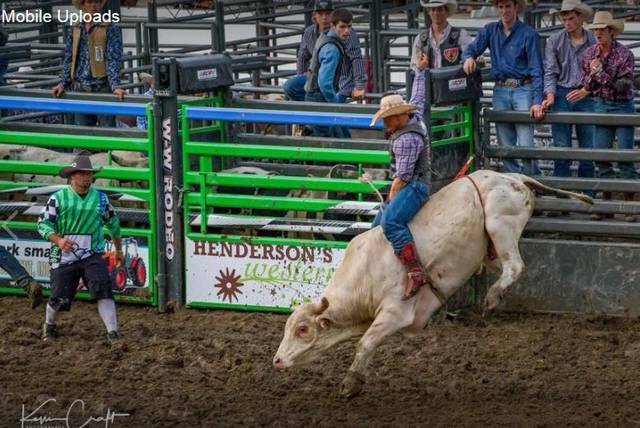 In order to qualify the cowboy must complete an eight second ride before touching the bull with his free hand or breaking free of the hold with his riding hand among other qualifications. The top six cowboys with the most points advance to the championship round. https://www.portsmouth-dailytimes.com/wp-content/uploads/sites/28/2018/08/web1_Bullriding-1.jpgBull riding and barrel racing by the Buckin B Cattle Company was held in the Grand Stand Arena Monday evening at the SciotoCountyFair. Pictured is a cowboy trying to qualify for his ride. In order to qualify the cowboy must complete an eight second ride before touching the bull with his free hand or breaking free of the hold with his riding hand among other qualifications. The top six cowboys with the most points advance to the championship round.